Media company Culture Machine’s recent move to grant paid leave to women employees on the first day of their menstrual cycle was, expectedly, not universally well-received. But what the radical move did was draw attention to women’s experience at the workplace and attempt to build a work culture that acknowledges the needs of half the world’s workforce. If nothing else, it took the topic of menstruation from dark boudoirs and gave it a brief moment in the sun. The silence and shame associated with a woman’s monthly cycles and all the taboos that become attached to her during this time have made women’s right to safe, healthy periods an especially difficult topic to address in India. This silence echoes in public policy discourses, tax laws, even science because of which there’s very little research to understand menstrual and reproductive health problems. “It’s a pity that a culture that puts so much merit on a woman’s fertility and childbearing capacity can so grossly neglect such an essential aspect of her reproductive health,” says Shradha Shreejaya, a biochemist, ecologist, safe menstruation activist, and founding campaigner at Sustainable Menstruation Kerala Collective. The coalition of NGOs, menstrual educators, activists and students educates the public with a view to promote menstruation equity, health rights, and sustainable alternatives to disposable menstrual hygiene products. As sanitary pads go, disposable ones are known to be a cocktail of synthetic fibres like rayon, plastic, artificial fragrances, absorbent polymers, gels and bleaches - none of which are disclosed on the product packaging due to the ‘medical devices’ status these products enjoy. And, most women believe it is cotton in their pads. Over two and a half years of continuous bleeding and exposure to about 4,000 pads, Shreejaya points out, a woman’s body is in close contact with these chemicals, whose role in hormone disruption and the rising rate of cervical cancers, PCOS and endometriosis has not been conclusively ruled out. In fact, evidence suggesting the effects of exposure to toxic chemicals in disposable pads has been systematically ignored by mainstream science. Dioxins, a group of chemicals used to bleach pads white have been listed by the World Health Organization (WHO) as one of the 'dirty dozen' – a group of dangerous chemicals known as persistent environmental pollutants and carcinogens. We might have to accept the rash, itching and foul odour as par for the course in disposable pads. But, there is no acceptable level of dioxins that one should be comfortable with. From an environmental standpoint, disposable feminine hygiene products are a disaster. If they are not burnt to release dioxins, they end up being washed into drains and water bodies or litter already burgeoning landfills. Municipal Solid Waste Management Rules call for them to be disposed along with dry waste, forcing sanitation workers to handle contaminated pads barehanded - a gross violation of their right to basic dignity. The rules privilege manufacturers, absolve them of any responsibility to provide adequate product information, re-engineer their offerings to make them safe, or bear responsibility for the safe disposal of sanitary waste. Laws today also put the burden of disposal of these products squarely on end users. In rural areas, where it is taboo to bury or burn used pads near places of worship or fields, women are known to collect days’ worth of used pads and walk long distances in search of suitable spots to discard them. In cities, mountains of sanitary waste are hidden away in unscientific landfills; but in rural schools, colleges and public toilets where waste collection is less streamlined, bins overflowing with soiled pads are a common sight. In 2011, the Ministry of Health and Family Welfare approved the Freedays scheme to sell subsidised sanitary pads to millions of adolescent girls in villages. However, no system was put in place to collect and dispose these napkins. In a rush to manage menstrual waste, the government, under the Nirmal Bharat Abhiyan, promoting mini incinerators in educational institutions to get rid of used pads. Not only are many of these machines incapable of generating the sustained 800C heat required to completely destroy the pads, they also emit dioxins and other toxic gases into the air. The ash particles pollute soil and water bodies. Incineration is never a solution for any kind of waste but it takes significantly more energy to completely destroy biomedical waste - which, environmentalists claim, is unviable in a country where energy is inequitably distributed. As we tiptoe around the M word in India, disposable sanitary pads are aggressively marketed to women as aspirational products carrying the promise of cleanliness, convenience and modernity. The language of advertising tells women that bulges are shameful, white, desirable and plastic, convenient. Disposables are the high road to empowerment. No smell, no stains. Use and throw. The 2011 statistic that only 12 percent of India’s menstruating women have access to hygienic menstrual products continues to be used to justify the spread of disposables. Latest NFHS data, however, points to a 60 percent penetration of sanitary pads in rural and urban India among women aged 15-24 years, and a 90 percent adoption in Kerala. The market for sanitary napkins in India is monopolised by two multinationals and the question of their safety remains unchallenged. It was with the view to mainstream menstruation conversation and awareness of the impact of disposable sanitary products on health, hygiene, environment and society that Sustainable Menstruation Kerala Collective and The Red Cycle launched Aarthava Yaanam - a one-of-its-kind menstrual marathon that traversed the 14 districts of Kerala. Says Kavya Menon, a biotechnologist, and originator and lead facilitator of the campaign, “Unless we create spaces to openly discuss women's health, we will never be able to find solutions to it.” Two years in the making, the volunteer-driven, crowd-funded campaign launched in November 2017 began in Kasargod and moved southwards towards Thiruvananthapuram. Over the course of two weeks, educational institutions, hospitals, orphanages, offices and public spaces became platforms where menstruation and women's reproductive health was discussed. The campaign reached about 20,000 people - men and women - with its message of the urgent need to end the shame and superstitions around menstruation, discuss the impacts of disposables on health and environment, and increase women’s awareness about safe, sustainable alternatives. "The challenge is to fight against the popular narrative that disposables are clean, convenient and healthy and have our motives in promoting reusables be questioned,” Menon says. The campaign was successful in getting the attention of big regional media outfits like Matrubhumi and Grihalaxmi who helped with pre-event publicity and post-event coverage. It also attracted the attention of Thiruvananthapuram MP, Shashi Tharoor and women leaders from various district administrations including the Deputy Mayor of Thiruvananthapuram, Rakhi Ravikumar and the Director of the Arogyakeralam who pledged support to the cause of sustainable menstruation. In some districts, MLAs promised to stop promoting incinerators and create budgets to distribute free cloth pads to girls instead. The campaign has made coherent demands of the local government: a change in the way menstruation education is conducted in schools and the normalisation of periods. The state of openness around menstruation in seemingly progressive Kerala leaves much to be desired, Menon discovered. Not only was the use of disposables prevalent among all age groups across social strata (except BPL populations), but awareness of reusable menstrual hygiene products was next to nonexistent. Reusable menstrual hygiene products are beginning to be addressed by vernacular media, but the predominant attitude towards them is one of indifference; of ‘they are not for me’. But, a few trailblazing homegrown brands like Namaskrithi, V-Cup and Kanika - are slowly gaining a toehold in Kerala's market for menstrual cups and reusable pads. Many people saw in Aarthava Yaanam a business opportunity to sell or distribute cloth pads and the interest among potential users has only been growing. Expecting a switch to reusables immediately after the event is a stretch, but people’s interest has been piqued and queries from schools and colleges for reusables has been encouraging. 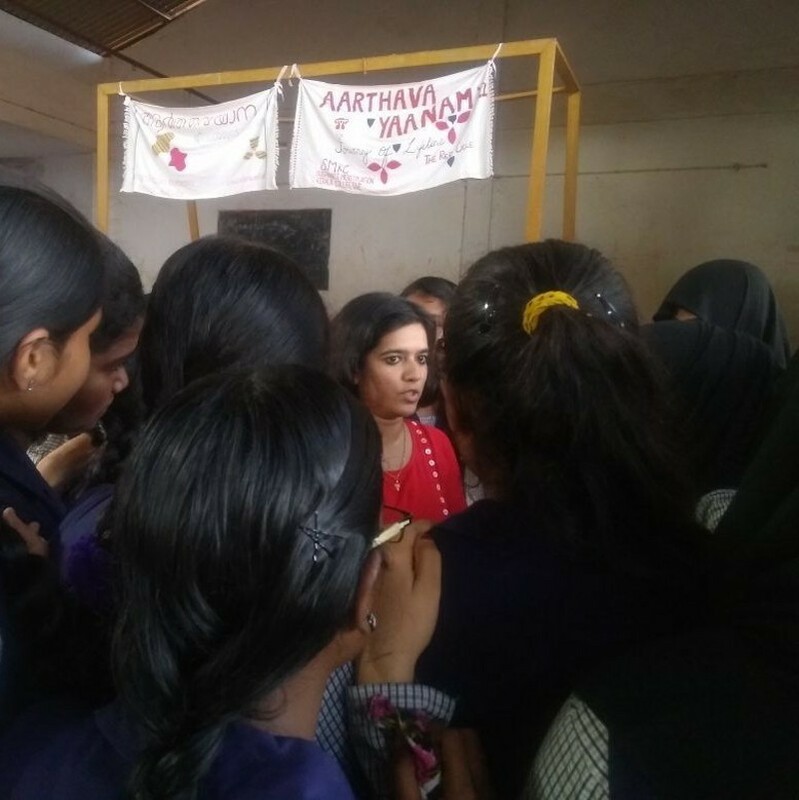 What’s an even better trend is that Aarthava Yaanam has set the ball rolling for further conversations: more girls say they’re discussing sustainable menstruation with their friends and getting an audience in their families. The campaign has received support from Green the Red, Bleed Safe and Happy, and Period of Sharing - groups and movements promoting sustainable menstrual hygiene across India. Following the example of Alappuzha’s decentralised waste management model, other districts of Kerala are zealously cleaning up their act. So how do menstrual waste and sustainable alternatives feature in the march towards zero-waste cities? They simply don’t. Sustainable menstruation is struggling to enter the already overwhelming, male-led discussions on solid waste management and coherent plans for a zero-waste model for sanitary waste are absent from policy discussions. While Aarthava Yaanam has gained significant ground in Kerala, both Menon and Shreejaya say that with the silence around women’s sexual and reproductive health rights, not much progress can be made by sustainable menstruation advocates. It’s doubly hard to make the case for reusables because of the stigma and revulsion associated with seeing and handling the menstrual blood these products require. Without a holistic understanding of women's reproductive health and open discussions about it, they say, sustainable menstruation will remain on the fringes and be considered a mere market tactic. In a context marked by the lack of access to clean toilets, running water, and private spaces to dry washed pads on the one hand and an obsession with intact hymens on the other, it will be a long time before reusable menstrual hygiene products like cloth pads and menstrual cups get a place at the table. If India’s recent ban on contraceptive ads on primetime TV is anything to go by, things don’t bode well for us. Today, disposable menstrual products swamp the market and manufacturers and governments freely distribute disposable pads to school girls and unsuspecting women. Yet the range of commercially available sustainable alternatives is limited as is the access to information we’d need to make better choices. The impacts of the products we choose extend beyond our bodies to the environment and the lives and dignity of others handling our waste. Marketed as aspirational, non-biodegradable sanitary products are a menace not just to the the long-suffering sanitary workers who have to carry it away but to new generations of young women who will bleed in silence. Yes, there is no conclusive evidence that links plastic pads to reproductive health disorders or cancers, but are we ok to wait until science is committed to tracking women for 3 decades to study the impact of toxic chemicals on their bodies? Or do we act preemptively and make the safe choice? The issues that Aarthava Yaanam raised are complex, cross-cutting and problematic. To get people thinking about sustainability, the conditions around them must be right - a life with dignity, access to clean water, and the power to purchase a product of their choice - which is why it’s hard to make the switch. A first step would be creating awareness about the implications to health and environment of disposable sanitary pads and making reusable products more accessible - steps that might help more women realise the dream of safe, healthy periods and not just stain-free pajamas.